It’s Princess Peanut Butter Jelly Time! Just in case you missed the part where I said she was “playful”! https://i0.wp.com/www.bullmarketfrogs.com/wp-content/uploads/2015/04/Brindle_pied_frenchbulldog.jpg?fit=662%2C662 662 662 Carol http://www.bullmarketfrogs.com/wp-content/uploads/2015/06/bullmarket-logo.png Carol2010-09-12 12:50:442010-09-12 12:50:44It's Princess Peanut Butter Jelly Time! Boogie is a K Kid at the French Bulldog Village. He’s a special needs French Bulldog who has regular hydrotherapy to help him regain the use of his legs. The Infamous Mystery Clock Unveiled! Thanks to everyone who donated to the French Bulldog Village’s “We’ll Stop at Nothing” fundraiser, Kimberly Rice has reluctantly agreed to unveil the mystery clock. Here is the infamous mystery clock! The fundraiser was dominated hands down by Kristen Boone of MD, with Tyree Pace of California coming in a determined but distant second. Altogether, we raised $425.00 for the privilege of revealing the mystery clock in all its ugliness. Thank you to all who contributed to make this fundraiser possible. We finally got to see the clock! Aw, Kimberly, it’s not that bad. Interesting muzzle, and I love the big stitches ala Frankenstein holding together the left side of the face! French Bulldog Village's Mystery Clock Unveiled! If for one minute you thought I was fibbing about the true UGLINESS of this clock–well, here is the proof. OH MY GOSH!!! I cannot believe you are going to actually publish this!!! I am going to have to send Kristin a REAL clock—I will let her pick the color and design. this one is just disturbing. The muzzle even looks like it is bleeding. Well, maybe not so much ‘in her own defense’, but at least she’s honest about this odd little clock’s faults. Personally, I think that this ‘ugly’ little clock (which was the forerunner of so many other, attractive clocks) is the absolute PERFECT fundraiser for French Bulldog Village, and the French Bulldogs that they help. After all, FBV doesn’t always get the prettiest Frenchies into rescue. In fact, FBV seems to get more than its fair share of the halt, the lame and the down right ‘disturbing’ dogs. Look at poor Bella – hairless and stinky and not exactly a French Bulldog beauty queen. And yet in her own way, Bella IS beautiful – just like this clock, Kimberly. Your clock shines with inner beauty (OK, maybe that’s just the glare off of the bloody stitches, but you get the idea). Either way, now you can’t say that you haven’t been forewarned – when it comes to raising money for French Bulldogs (and the occasional pug, Frenchie mix, and ‘oh, what the hell – if you squint it sorta looks like a Frenchie’), FBV will STOP AT NOTHING! And remember, just because this fundraiser is over doesn’t mean that you can’t still give to FBV. After all, the world needs to have a place where the not so pretty French Bulldogs can turn to for help, and that place is French Bulldog Village. Let’s help them keep their doors open, so that no dog is turned away. Use the paypal button below to give – don’t make us show you more photos of the clock. https://i0.wp.com/www.bullmarketfrogs.com/wp-content/uploads/2015/04/Brindle_pied_frenchbulldog.jpg?fit=662%2C662 662 662 Carol http://www.bullmarketfrogs.com/wp-content/uploads/2015/06/bullmarket-logo.png Carol2009-11-23 05:03:552009-11-23 05:03:55The Infamous Mystery Clock Unveiled! Those shameless little monkeys over at the French Bulldog Village are rolling out their big guns for this season’s fund raising efforts. Some of you out there, who happen to be French Bulldog Village volunteers or who visited the FBVillage booth at the 2009 French Bulldog Club of America National Specialty in Massachusetts, are the lucky owners of French Bulldog clocks lovingly hand painted and glazed by our very own FBVillage board member Kimberly Rice in the wee hours of the night when she finally got home from work every night. A real labor of love and some very beautiful clocks. These clocks were so popular among our volunteers that we had a dreadful time keeping any back in order to have some to sell at the Specialty show! So, I really, really want to see this clock, but several months of browbeating and begging and whining have not produced a picture of Clock #1. Kimberly says it is just too ugly. No pictures. Go away. Well, I finally convinced her to turn it into a fundraiser. Sort of a hideous silent auction. Here is how it works. 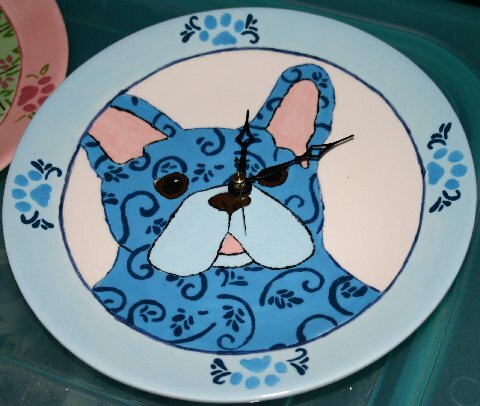 We are asking for donations in any amount to PayPal – the donate button is right on the front page of the French Bulldog Village website – AND when we reach $300.00 in donations, the auction will close, and Kimberly will produce a picture of Clock #1, AND she will ship it at no additional cost to the highest donor. Unless of course, the person, upon seeing Clock #1, says, um, er, oh my, no thanks! Alternately, we can mail it to your dearest friend in your name… Or, we can mail it to the next highest lucky donor on our list. And so on, until someone agrees to take Clock #1 and give it a home. Poor Clock #1, her own mommy doesn’t love her. Kimberly is being very brave about this. And I HAVE to see this clock. Please donate! Here’s a PayPal button link, to allow you to bid (HIGH and OFTEN) on the mystery clock. 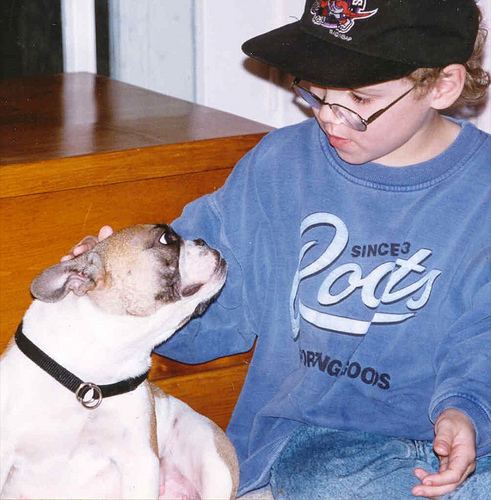 Remember, every single dollar benefits the K Kids and the other French Bulldogs and French Bulldog mixes that the French Bulldog Village assists. 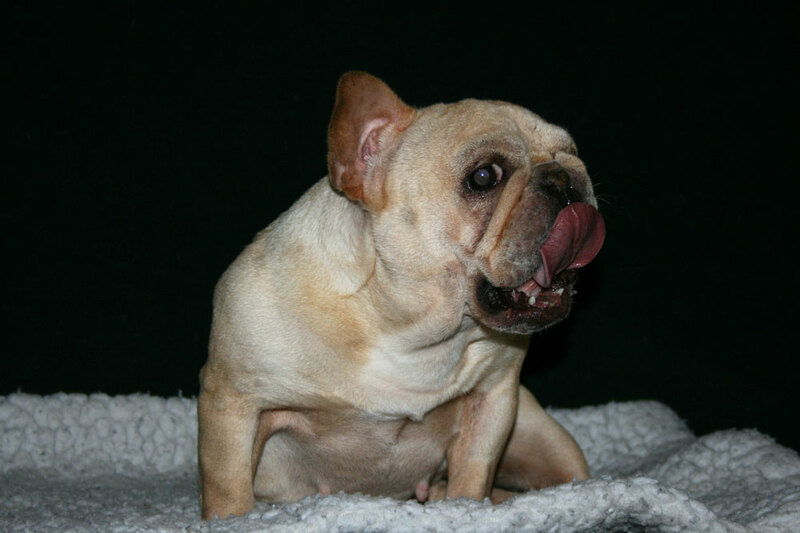 FBV is the last resort for the French Bulldogs that other rescues turn down – please don’t make FBV have to start turning down Frenchies for lack of funds. A gallery of the beautiful clocks Kimberly has designed – remember, no one gets to see Clock #1 until the auction is OVER! We’ll be unveiling it right here, as soon as FBV unleashes it on the world.